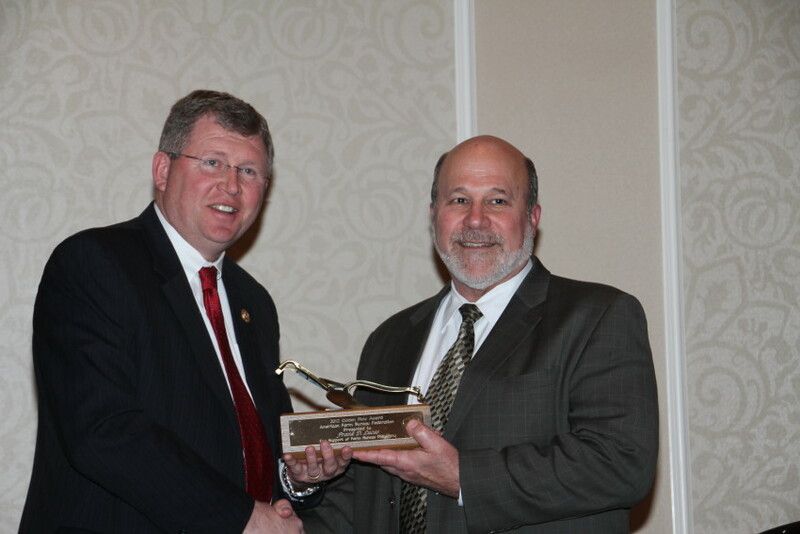 The Chairman of the US House Agriculture Committee, Frank Lucas, R-OK, received American Farm Bureau’s Golden Plow Award on Monday evening, during Oklahoma Farm Bureau’s annual leadership conference at the Skirvin Hotel, Oklahoma City. The President of the American Farm Bureau, Bob Stallman, flew in from Washington to present this highest honor from AFBF to Chairman Lucas in front of his home state farmers and ranchers. Representative Lucas is a fifth generation Oklahoman whose family has lived and farmed in the state for more than 100 years. He was first elected to the U.S. House of Representatives in 1994 and is currently serving his 11th term. Representing Oklahoma’s third district, which comprises 32 counties in western and northern Oklahoma, Lucas is well aware of the major rural and agricultural issues. Lucas is only the fourth Oklahoma lawmaker to receive the award- and the first member of the US House of Representatives from the state to be so honored. Sen. David Boren (1990), Sen. Don Nickles (1992) and Sen. Jim Inhofe (2010) are past recipients. We have the full audio of the remarks given by Chairman Frank Lucas in response to being honored by the general farm organization. Click on the LISTEN BAR below to hear those remarks.